We recognise climate change as a contributing factor in increased economic and security risks globally. 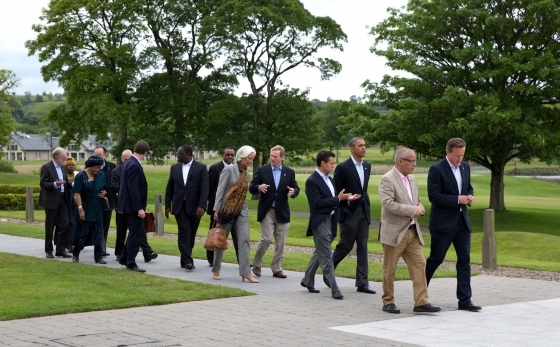 The G8, though an informal body that does not emit legally-binding products, is very influential in setting the global agenda on a range of issues – particularly in regards to economic policy. That’s why Summits always include heads of state, and not just representatives. If climate change is seen collectively by the G8 as a contributing risk to the global economy, and to global security, then it becomes imperative for member nations to take serious steps to slow climate change down, and to mitigate its effects. Though it may not seem so important on the surface, buried as it is in a somewhat colorless document, this declaration may signal the start of a much more earnest round of action by the international community on climate change. If that doesn’t happen, we can at least point to this document and call on the G8 nations to advance measures commensurate to the risk they themselves identified. By Caitlin Werrell and Francesco Femia in climate and security on June 25, 2013 .